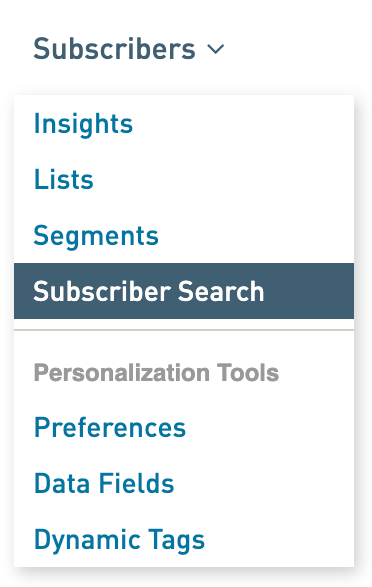 Look up your SMS subscribers in WordFly using Subscribers > Subscriber Search. First, copy the subscriber’s mobile number. Omit dashes and other special characters from the number before copying. 2. Paste in your subscriber's mobile number and click Search. 3. Select the subscriber from the search results. Each mobile subscriber an email address, it will be formatted like this ‘mobilenumber@smpp.wordfly.com’. 4. You're now in the Subscriber Profile! View the mobile subscriber’s data and activity right in WordFly. Review the SMS subscriber's profile landing page. Click on the Subscriber Activity page or Lists page to see more information about your mobile subscriber.